In this lesson, we will learn how to solve problems on the motion of a system of two bodies suspended vertically by a string passing over a smooth pulley. Two bodies of masses 12 kg and 18 kg are attached to the ends of a light inextensible string which passes over a smooth pulley. Determine the acceleration of the system. Take 𝑔 = 9 . 8 / m s 2 . Two masses are attached to the ends of a light inelastic string passing over a smooth pulley. Given that 𝑚 1 accelerates vertically downward at 4 4 1 / c m s 2 and that the acceleration due to gravity 𝑔 = 9 . 8 / m s 2 , determine 𝑚 ∶ 𝑚 1 2 . Two bodies of masses 𝑚 1 and 𝑚 2 , where 𝑚 > 𝑚 1 2 , were attached to the ends of a long light inextensible string which passed over a smooth pulley. When the system was released, the larger mass descended 371 cm in 2 seconds. Later on, a body of mass 105 g was added to the smaller body. When this system was released, the compound body descended 414 cm in 3 seconds. Calculate the mass of each of the bodies, and take 𝑔 = 9 . 8 / m s 2 . Two masses, 832 g and 𝑚 g, are attached to the ends of a light inextensible string passing over a smooth pulley. If the maximum tension of the string is 332.8 g-wt, what is the greatest possible value of 𝑚 ? Take the acceleration due to gravity 𝑔 = 9 . 8 / m s 2 . Two masses, connected to each other by a light inextensible string passing over a smooth pulley, are left to hang freely vertically below the pulley. If the tension in the string was 248 N, find the force exerted on the pulley. Two masses of 5 𝑚 and 2 𝑚 kilograms are connected to each other by a light inextensible string passing over a smooth pulley. Given that the system was released from rest and that the force exerted on the pulley during the motion was 238 N, determine the value of 𝑚 . Take 𝑔 = 9 . 8 / m s 2 . Two masses of 143 g and 77 g are connected to the ends of a light inextensible string passing over a fixed smooth pulley. Given that the two masses were hanging freely vertically below the pulley and that the system was released from rest, find its velocity 4 seconds later. Take 𝑔 = 9 . 8 / m s 2 . Two bodies of masses 19.1 and 6.5 kilograms are connected by a light inextensible string of length 35 cm passing over a smooth pulley. When the system was released from rest, the heavier body was next to the pulley. Determine the speed of the lighter body when it reached the pulley. Take the acceleration due to gravity 𝑔 = 9 . 8 / m s 2 . Two masses 𝑚 and 88 g are attached to the ends of a light string passing over a smooth pulley. Determine the value of 𝑚 , given that, when the system was released, the other mass descended 11.76 m in 2 seconds. Take the acceleration due to gravity 𝑔 = 9 . 8 / m s 2 . Two bodies of masses 270 and 𝑚 grams are connected by two ends of a string passing over a smooth pulley. The body of mass 𝑚 was projected downwards at 105 cm/s and, 3 seconds later, it returned to its initial position. Find the value of 𝑚 and the tension 𝑇 in the string. Take 𝑔 = 9 . 8 / m s 2 . Two bodies of masses 644 g and 156 g were connected to the ends of a light inextensible string passing over a smooth pulley. The system was released from rest and, 2 seconds later, the larger mass hit the ground. Find the maximum height the smaller mass reached above its initial position. Take the acceleration due to gravity 𝑔 = 9 . 8 / m s  . Two bodies of masses 807 and 538 grams are attached to the ends of a light inextensible string which passes over a smooth pulley. The two bodies are left to hang freely vertically below the pulley. The system was released from rest when the two bodies were on the same horizontal level. Given that the first body hit the ground after covering a distance of 2 cm, determine the time elapsed from the moment the system was released until the second body came to an instantaneous rest. Take 𝑔 = 9 . 8 / m s 2 . Two bodies of masses 8.7 and 11.6 grams hung vertically from the ends of a light inextensible string passing over a smooth pulley. When the bodies were released from rest, they were on the same horizontal level. Determine the vertical distance between them one second after they started moving. 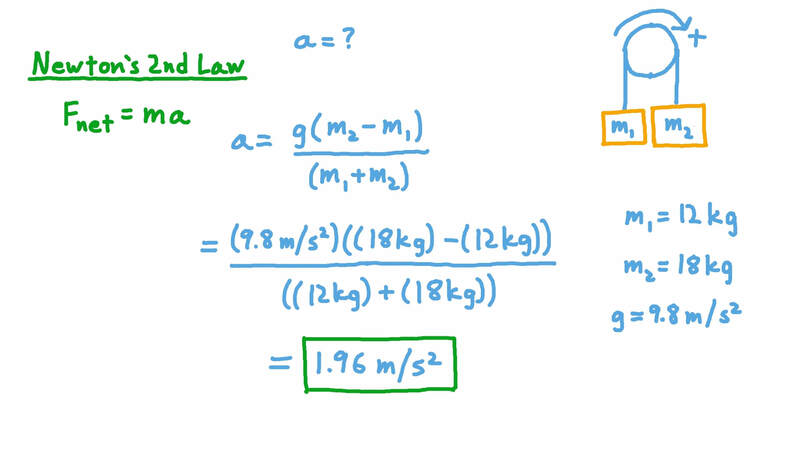 Take the acceleration due to gravity 𝑔 to be 9.8 m/s2. A light string of constant length passes over a smooth pulley. It is connected to two masses of 408 g and 327 g. When the system was released from rest, the two masses were on the same horizontal level. Find the time taken for the vertical distance between the two masses to become 13.23 m. Take 𝑔 = 9 . 8 / m s 2 . Two masses 𝑚 1 and 𝑚 2 are connected to each other by a light inelastic string passing over a smooth pulley. The system was released from rest when the two bodies were at the same height above the ground. Given that the vertical distance between the two bodies became 60 cm in the first second of motion, find 𝑚 ∶ 𝑚 1 2 . Take 𝑔 = 9 . 8 / m s 2 . Two bodies of masses 374 g and 102 g were connected to each other by a light inextensible string passing over a smooth pulley. The two bodies started at rest on the same horizontal level. Then one second after the system was released, the string broke. Determine the vertical distance between the two bodies one second after the string broke. Take the acceleration due to gravity 𝑔 = 9 . 8 / m s  . A light inelastic string passes over a fixed smooth pulley. One of its ends carries a body of mass 2.25 kg. The other end carries a spring balance of mass 900 g. A mass of 350 g was added to the spring balance. Given that the system was released from rest, find the reading of the spring balance during the movement of the system. Take the acceleration due to gravity 𝑔 = 9 . 8 / m s 2 . Two bodies of masses 𝑚 g and ( 𝑚 + 5 6 ) g are connected to each other by a light string which passes over a fixed smooth pulley. The system was released from rest when the two bodies were at the same horizontal level. One second later, the vertical distance between them was 128 cm. Find the magnitude of the force exerted on the pulley while the bodies were in motion. Take the acceleration due to gravity 𝑔 = 9 . 8 / m s  . Two bodies of the same mass 𝑚 are attached to the ends of a light inextensible string passing over a smooth pulley. When a weight of 143 g was added to one of the two bodies, the tension increased to 3 6 2 5 times its previous value. Determine the value of 𝑚 . Take 𝑔 = 9 . 8 / m s 2 . Two bodies, 𝐴 and 𝐵 , of equal mass 𝑚 g were connected to one another by means of a light inextensible string which passed over a smooth pulley. A mass of 44 g was added to body 𝐴 and the system was released from rest. Body 𝐴 hit the ground after moving 64 cm, whereas body 𝐵 continued its motion upwards until it momentarily came to rest 80 cm above its starting point. Find the value of 𝑚 , given that the acceleration due to gravity 𝑔 = 9 . 8 / m s 2 . Two bodies 𝐴 and 𝐵 each of mass 70 g were connected together by a light inextensible string of length 257 cm passing over a smooth pulley. A third body 𝐸 of mass 35 g was connected to 𝐵 by a similar string of length 64 cm and was left to hang freely vertically below. When the system was released from rest, 𝐴 and 𝐸 were on the same horizontal level. A few moments later, when 𝐴 and 𝐵 were on the same horizontal level, the string between 𝐵 and 𝐸 was cut. Find the total time it took for body 𝐴 to reach the pulley from the moment the system started moving. Take the acceleration due to gravity 𝑔 = 9 . 8 / m s 2 . Three bodies 𝐴 , 𝐵 , and 𝐶 of masses 19, 18, and 43 kg, respectively, were connected to each other by a light inextensible string passing over a smooth pulley such that bodies 𝐵 and 𝐶 are on the same side of the pulley. The system was released from rest and moved for 4 seconds, at which point the string holding body 𝐵 to 𝐶 snapped. Find the velocity 𝑣 of body 𝐴 just before the string snapped and the time taken for body 𝐴 to come to rest after it snapped. Take the acceleration due to gravity 𝑔 = 9 . 8 / m s 2 . Two scale pans of the same mass are attached to the ends of a light inextensible string passing over a smooth pulley. Masses of 935 g and 514 g were placed in the scale pans. If the masses in the scale pans were doubled, the acceleration of the system would be 7 5 of its previous value. Determine the mass of one of the scale pans. Take 𝑔 = 9 . 8 / m s 2 . A scale pan of weight 4 kg-wt was carrying a weight of 53 kg-wt. It was connected to a light inextensible rope passing over a smooth pulley vertically above the pan. On the other end, a child of weight 41 kg-wt was clinging to the rope. When this system was moving, the force exerted on the pan by the weight was 𝐹 1 newtons. After a while, the child started to climb the rope. The force generated by the child climbing the rope brought the scale pan to a state of rest. During this stage of the motion, the force exerted on the pan by the weight was 𝐹 2 newtons. Find 𝐹 − 𝐹 2 1 . Take 𝑔 = 9 . 8 / m s 2 . Two bodies of masses 𝑚 and 69 g were attached to the ends of a light string of constant length which passed over a smooth pulley fixed to the edge of a smooth horizontal table. The first body was resting on the table, and the second one was freely hanging vertically below the pulley. When the system was released, the hanging body descended 10.35 metres in 3 seconds. Determine the value of 𝑚 . Take 𝑔 = 9 . 8 / m s 2 .